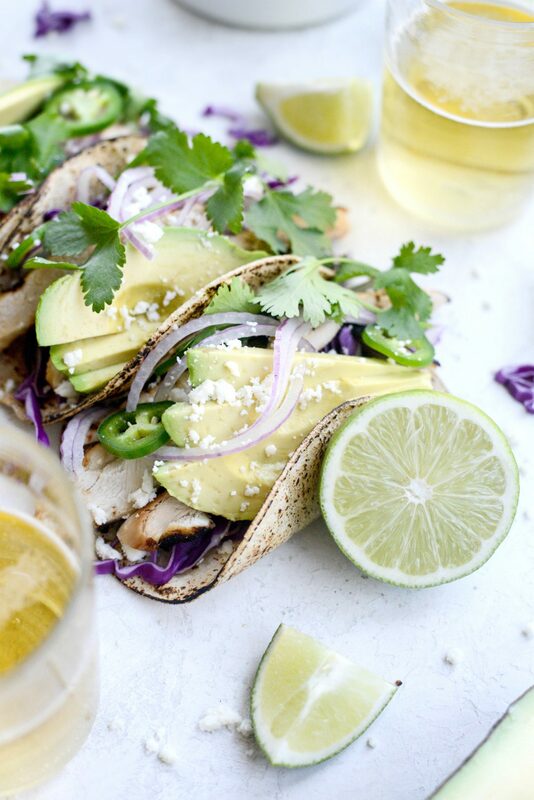 Tequila and lime collide in the most delicious Grilled Tequila Lime Chicken Tacos! Chicken marinates in a sweet meets sour, garlicky and a smidgen spicy marinade. 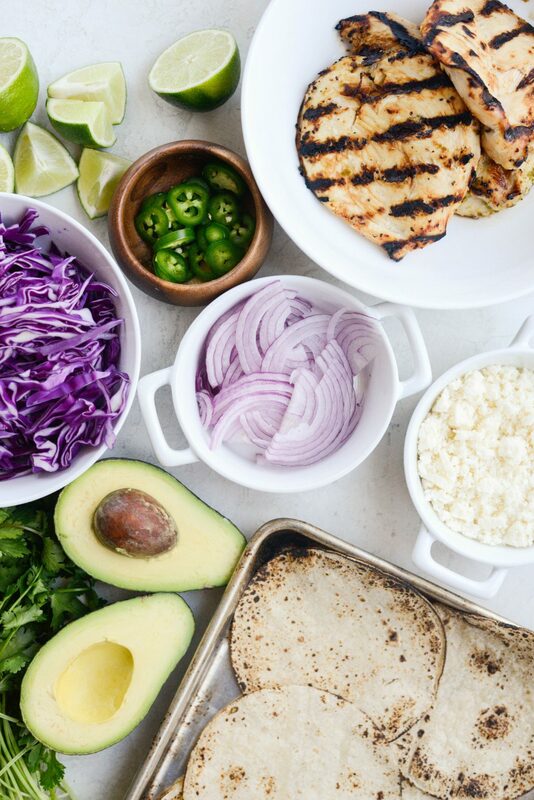 Grilled to perfection, stuffed into corn tortillas with crisp cabbage, red onion, queso fresco, fresh cilantro and slices of avocado. When I think of Cinco de Mayo, I think of two things and two things only. Margaritas and tacos. Not just because they’re two of my most favorite things in the whole world, but also because they go hand in hand. Literally. Marg in one hand, taco in the other. 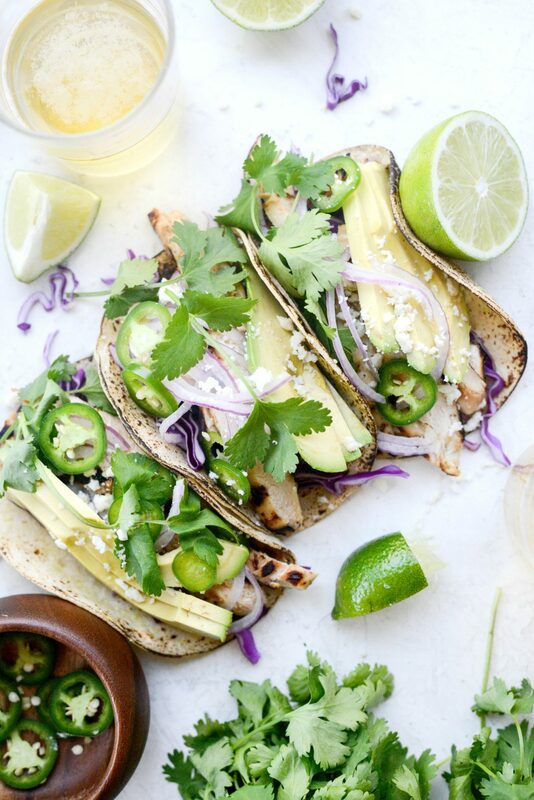 So for this Cinco de Mayo I’m merging the two and creating the ultimate dinner: grilled tequila lime chicken tacos. Originally there were a few more step-by-step photos of the marinade, but then I accidentally deleted those along with a WHOLE other recipe for a totally separate post. To say I’m bummed is an understatement. 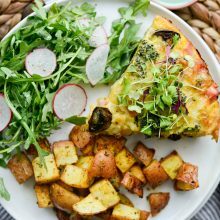 I literally just finished blogging a recipe and ran out of space on my SD card and while I thought I was deleting old images, apparently I deleted the ones I just took. But hey, that’s okay. We still have tacos. And margaritas, right? The two together make everything better. Or numbs the pain a little. Thank you tequila. 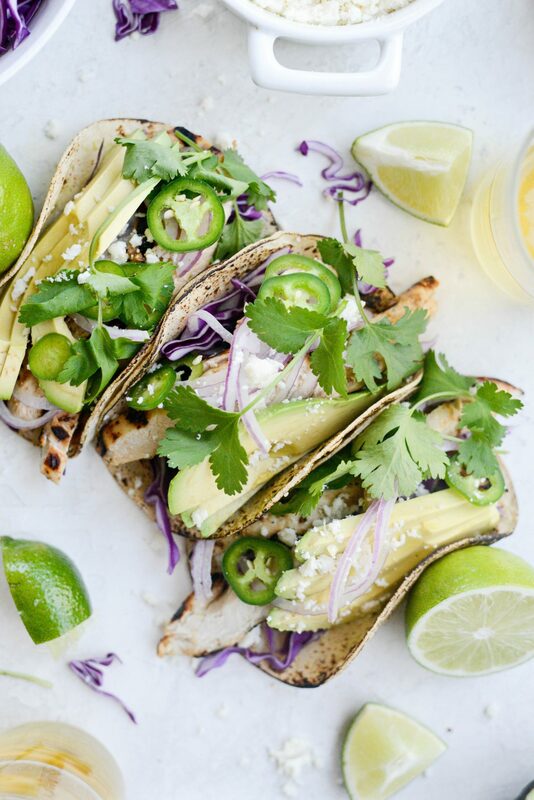 To make these tacos you’ll need grilled tequila lime chicken, corn tortillas, purple cabbage, red onion, cilantro, avocado, queso fresca or Cotija cheese, jalapeños and lime wedges. Earlier in the afternoon, I whipped up this super simple marinade in my mini food processor that smelled like a margarita. I was instantly thirsty. Is 1 pm too early to crave a margarita? Asking for a friend. 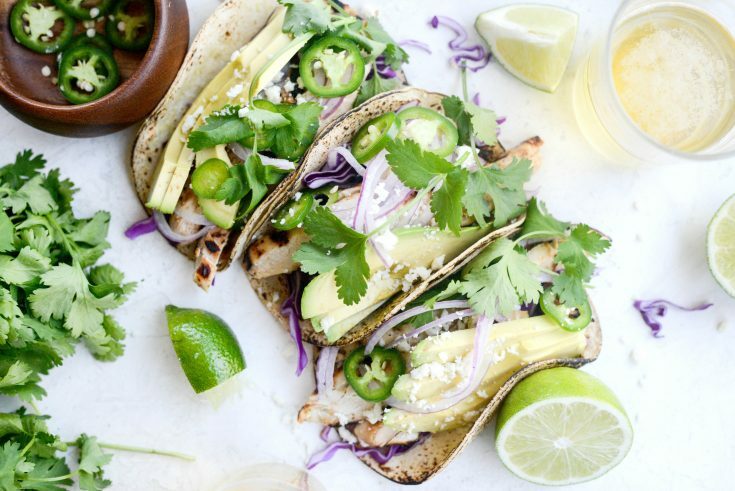 Anyways, for the marinade you’ll need 4 cloves peeled garlic, 1 seeded and diced jalapeno, 1/4 cup fresh lime juice plus the zest of 1 lime, 2 tablespoons agave, 2 tablespoons olive oil, 1/4 teaspoon black pepper and 1/2 cup tequila blanco. Add it all into your food processor and puree to combine. Next, place the chicken breast halves in a gallon size re-sealable bag and pour the marinade over top. Seal and work the marinade into the chicken. 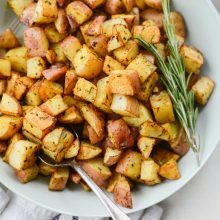 Place in a shallow dish and and pop it into your fridge to chill for 1 hour. 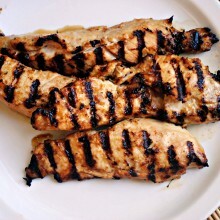 Remove the marinating chicken from your fridge and place it on your counter for 20 to 30 minutes prior to grilling. Try not to let the chicken marinate longer than 1-1/2 hours to avoid the citric acid from “cooking” or “ceviche-ing” the chicken. Preheat your grill to 450°. Once hot, remove the chicken form the marinade and place it on the preheated grill grates, season with kosher salt and close the lid. 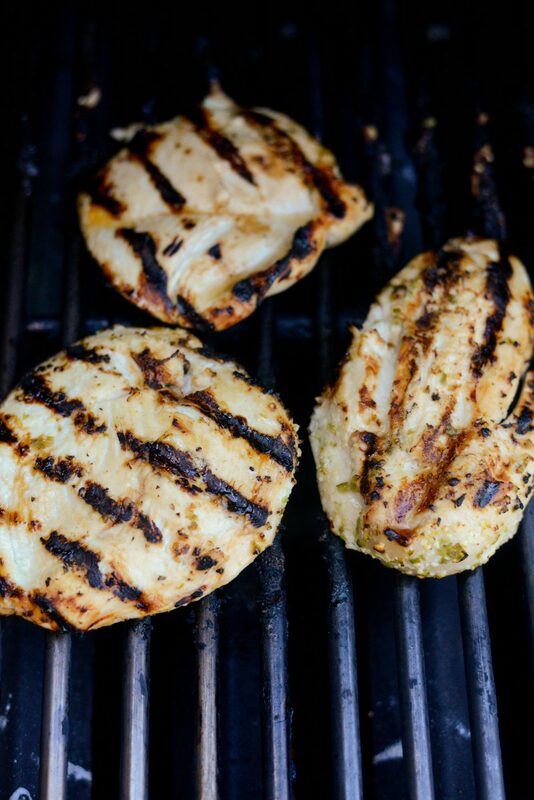 Then grill for 4 to 6 minutes or until grill marks form and the chicken releases from the grill grates easily. Next, turn the chicken, close the lid and continue grilling for another 4 to 5 minutes until the chicken is no longer pink and is fully cooked. Then transfer to a cutting board to rest under tented foil for about 5 minutes before slicing. 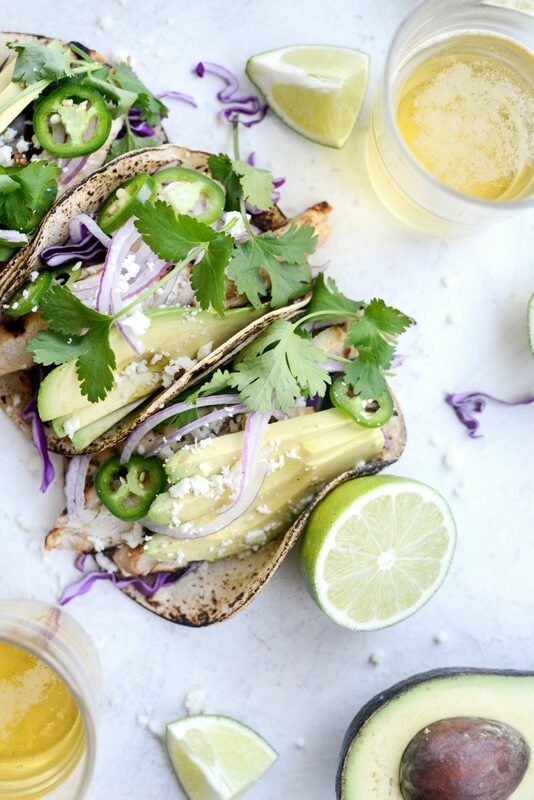 Next top toasted corn tortillas (I used white corn and my kitchen torch to toast them with cabbage, slices of grilled tequila lime chicken, avocado, onions, cheese and cilantro. Lastly, squeeze fresh lime juice over top and unhinge your jaw to accommodate this mammoth taco. Finally. 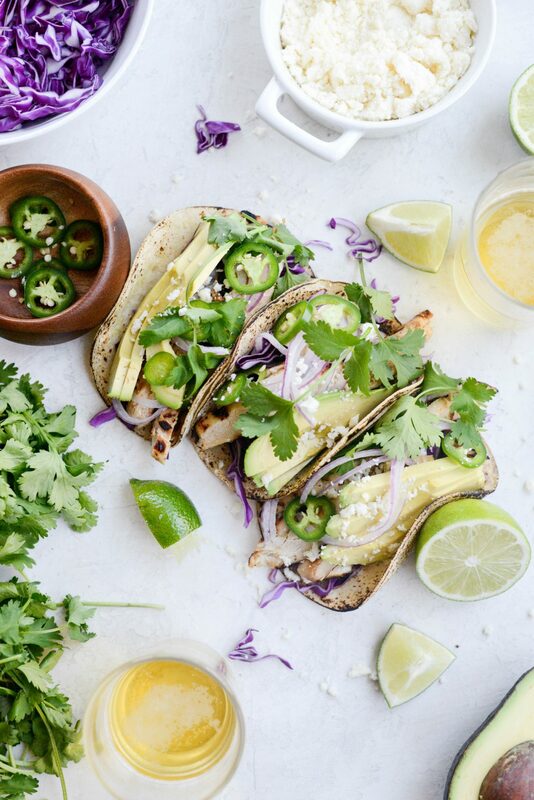 These tacos are light and flavorful and packed with lots of textural deliciousness. I love the crunch of the cabbage, the toasty corn tortillas and the creamy saltiness of the queso fresco. Actually, I love it all. Enjoy! 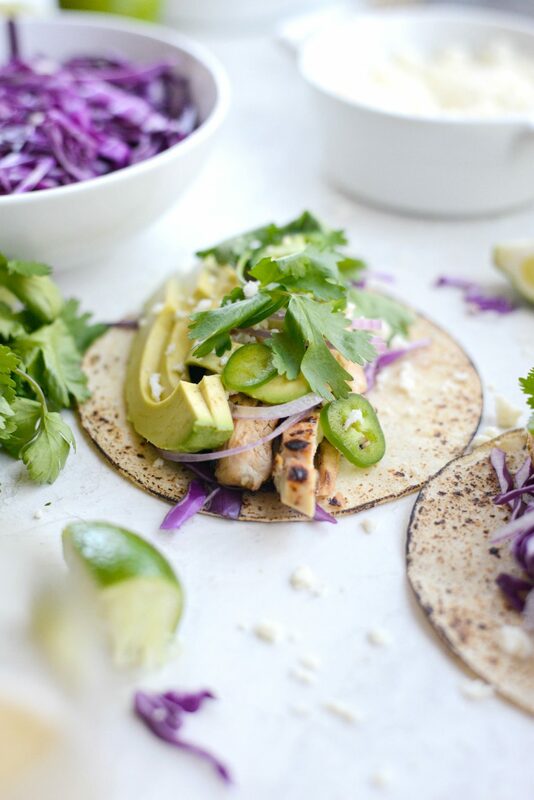 And if you give these Grilled Tequila Lime Chicken Tacos a try, let me know! Snap a photo and tag me on twitter or instagram! Place the chicken breasts into a resealable bag. 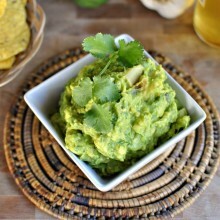 In the bowl of your food processor, place the garlic, jalapeño, agave, lime juice, zest, tequila, olive oil and black pepper. Puree until smooth and the pour over the chicken. 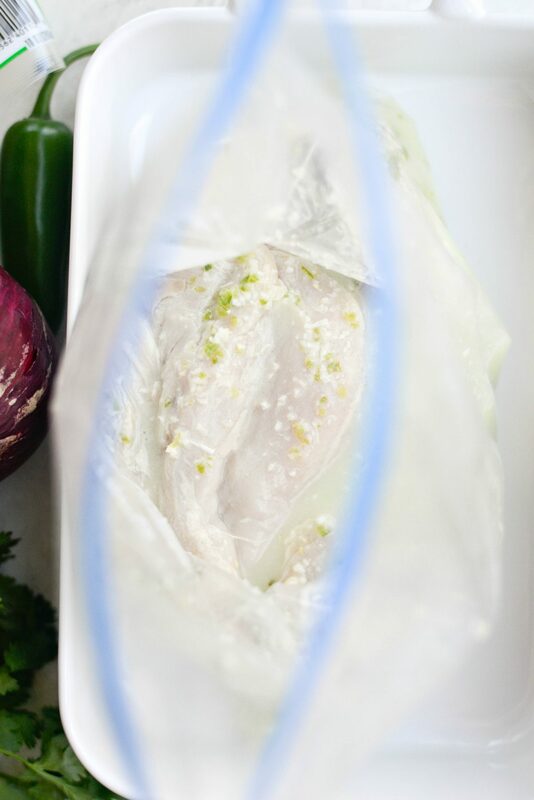 Seal the bag and refrigerate for 2 hours. 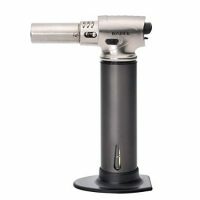 Preheat your grill to 450°. 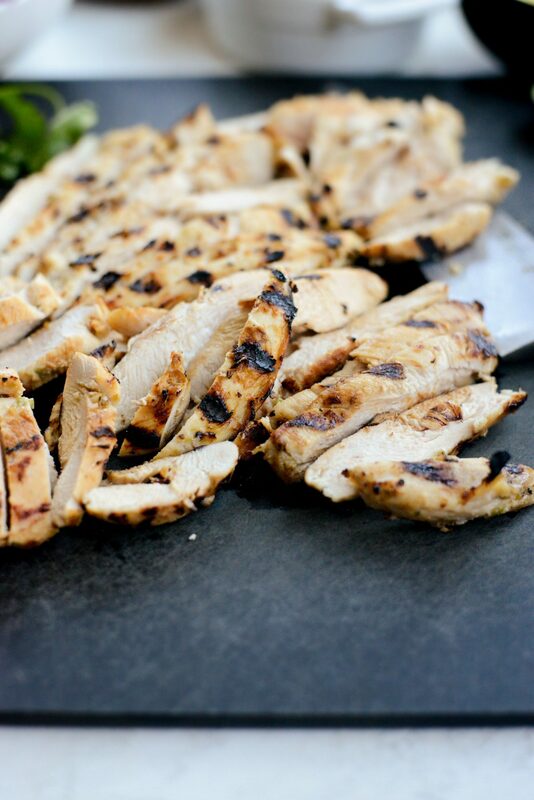 Once hot, remove the chicken from the marinade, place onto the hot grill grates and season with kosher salt. Grill for 4 to 6 minutes before tuning and continuing to grill for 4 to 5 minutes more, or until the chicken is fully cooked and no longer pink. 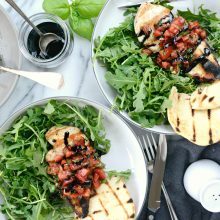 Transfer the grilled chicken to a cutting board. Allow the chicken to rest for 5 minutes under tented foil so the juices can redistribute. 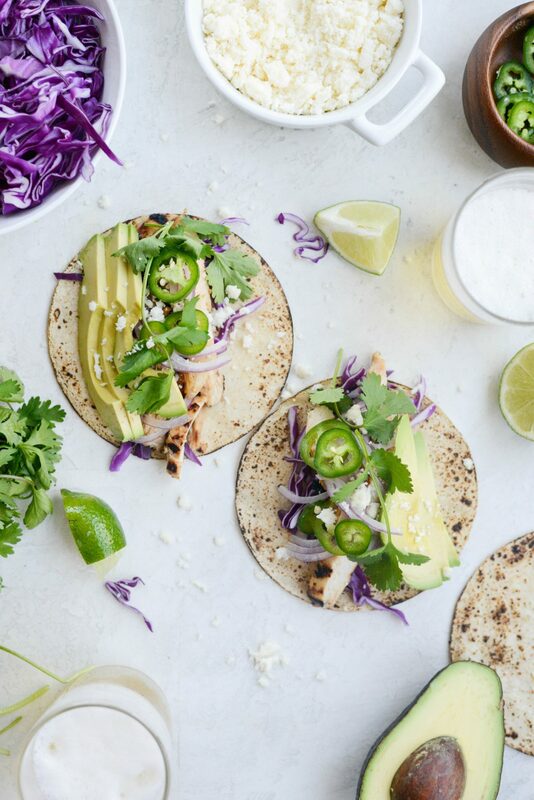 Slice or chop the chicken into bite-sized pieces before filling toasted corn taco shells and topping with cabbage, cilantro, onion, avocado, sliced jalapeños and Cotija. Squeeze fresh lime juice over top and ENJOY! 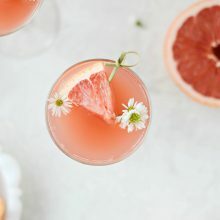 Is there a subsitute I could use for the tequila? Hmm, well since it’s the main ingredient I unfortunately don’t think so . I would suggest maybe using more lime juice? 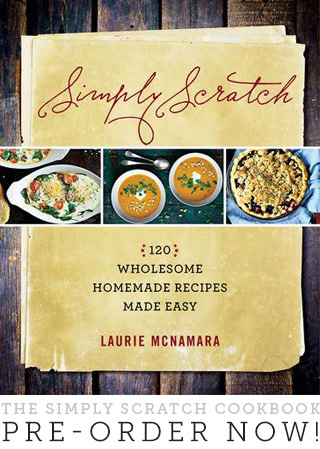 I’m glad to hear you enjoyed the recipe!